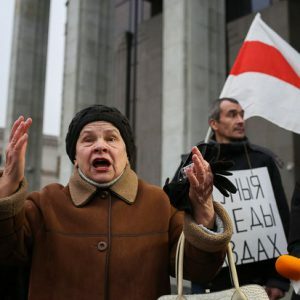 BelarusDigest > All > Can anger sustain the Belarusian protests? On 16 February, Dmitry Peskov, Vladimir Putin's press secretary, announced that the Kremlin does not plan to introduce a visa regime with Belarus. His statement comes in a context of increasingly harsh measures on behalf of Moscow towards Belarus over the past half year, beginning when Russia decided to partially reinstate its border with Belarus, which had been abolished in 1995. According to a version of the story widely circulated in the Russian media, probably also supported by the Kremlin, Moscow had to partially restore its border because of Minsk's negligent policies. First, for years Minsk has been re-importing sanctioned commodities from the European Union. Secondly, the absence of border control between Belarus and Russia has allowed persons unwanted by Russia to enter its territory via Belarus. Thirdly, President Lukashenka's introduction of a five-day visa-free regime on 9 January for nationals of 80 countries has critically compromised Russian security. Only the first of these claims can be seen as legitimate, albeit with serious reservations. The rest are highly dubious. After all, any real border control between Belarus and Russia disappeared in 1995; unwanted people have been able to enter Russia through Belarus for years. Even though the Russian government has not reported any gross violations or crimes since, this has all of a sudden become a problem. Explanations from Russian officials regarding why Moscow suddenly decided to partially close the border seem ridiculous. On 10 February, Russian ambassador to Minsk Aleksandr Surikov stated to TASS news agency that Moscow is establishing border control zones along the border with Belarus to prevent extremists from Syria, specifically ISIS terrorists, from entering Russia through Belarus. Belarus-Russia border checks: Who started it all? The timing of the decisions taken by Minsk and Moscow further undermines Russian claims that it is merely responding to moves by the Belarusian government. Last autumn, Russia – apparently without prior notice – shut down its border with Belarus for third-country nationals. This seriously hurt Belarus, which is striving to become a major transit hub. Next, towards the end of December, the director of the Russian Federal Security Service (FSB), Aleksandr Bortnikov, signed orders establishing a border control zone in Russian regions adjoining Belarus. The orders remained secret until 1 February, creating an impression that he was responding to Lukashenka's decision to liberalise the visa regime. In reality, the opposite could have been the case: Lukashenka could have made his decision after learning about the FSB move. This seems more logical. Minsk had been reluctant to liberalise its visa regime for years – most probably because it worried about Moscow's possible response. However, following the FSB's decision, the Belarusian leadership realised that it had nothing more to loose. Both the closing of the border for third-country nationals and the establishment of border-control zones coincides with increasingly negative media coverage of Belarus in Russian. The latter factor leads to more Russians supporting the former. Last week, the Russian mainstream media gave much airtime to the results of an opinion survey conducted by the reputable sociological institute VTsIOM, which showed that 78 per cent of Russians favoured introducing visas for Belarusians. Russian government officials and political commentators have criticised the EU and former Eastern-bloc countries for destroying decade – even century-old links – in the region, as Eastern European countries integrate with the EU. Although this criticism sometimes rests on facts, the Kremlin's behaviour makes such complaints seem hypocritical. On 8 February, Belarusian Deputy Energy Minister Vadzim Zakreuski announced that Belarus agreed to purchase more Russian electricity. At the same time, despite available opportunities to buy electricity from Ukraine, Minsk failed to reach an agreement with Kyiv on prices. Belarusian purchases of Ukrainian electricity had been falling since 2014, due both to the unreliability of the Ukrainian energy sector and Russia offering lower prices. Thus, in 2015 the Russian energy giant Inter RAO doubled its annual deliveries to Belarus from 1.4m MWh to 2.8 MWh. This was mostly connected by reducing purchases from Ukraine. Russia resorts to similar, seemingly economic mechanisms to redirect Belarusian export and import flows to its own ports in Leningrad Province. Since 2006, Moscow has urged Minsk to stop using Lithuanian and Latvian ports and switch to more distant Russian alternatives. Minsk realises the dangers of Moscow monopolising its connections with the outside world and has so far resisted such proposals. Yet the Kremlin continues in its efforts to deprive the Baltic states of transit revenue. Last October, the Russian Railways granted Belarus a 25 per cent 'unprecedented discount' to redirect its oil-product exports away from the Baltic states to Russian ports. Commenting on this proposal, the Moscow-based Kommersant daily conceded that the move could be political. It implied that the offer emerged after plans to suppress transit through the Baltic states had been discussed by special representative and confidante to the Russian president Sergei Ivanov. 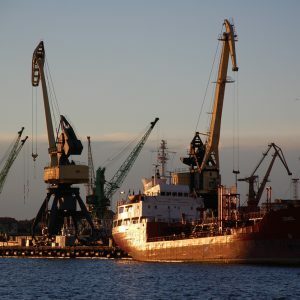 At a conference he held in September, various Russian firms and government agencies reportedly discussed how to convince Belarus to commit itself to using Russian ports. Yet Putin's attempts to drive a wedge between Belarus and its neighbours have produced scanty results. A case in point are Moscow's efforts to take over Belarusian export flows – Minsk has resisted them since 2006. On 24 January, Sputnik-Belarus, a media source associated with the Russian government, commented that: 'A discount was given to Belarus [to facilitate its export through Russian ports] yet to no avail.' Minsk's actual investments and plans clearly demonstrate its willingness to keep working with the Baltics. For instance, Belarusian Potash Company has been buying up shares in Klaipeda port facilities since 2013. Moreover, Minsk would probably use Latvian ports if it wanted to bring Iranian oil to Belarus. In other words, the Kremlin only has limited leverage with Minsk, despite the Russian leadership's interest in convincing Belarus to use Russian ports. After all, the ports in question are reportedly owned by personal friends of Vladimir Putin. Minsk is aware of the risks of decreasing diversification in its links with the external world. Even the decision to stop purchasing Ukrainian electricity may have more to do with instability in Ukraine than willingness to obey Moscow. The Belarusian government adamantly refuses to side with any party in ongoing regional conflicts. The situation with the Russian border shows the price Minsk must pay for this position. The Kremlin actively contributes to undermining the legacy of Soviet and pre-Soviet integration between Belarus and its neighbours, including Russia itself. The collapse of links between states in the region increases the risk of instability and conflict and guarantees the deterioration of living standards.